Mobile, Alabama is on of my favorite places. It has a long history that mixes cultures and blends stories ina a way that is entirely new. We travel to Mardi Gras in Mobile every year and I was sure to pick up a few ghost stories along the way. This was one of my favorites. 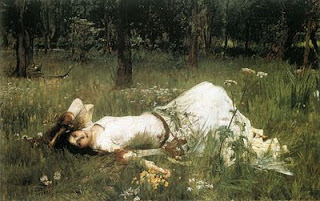 It plays to my romantic side and brings to mind Waterhouse portraits of Ophelia. Mobile was celebrating the third Mobile Mardi Gras in 1703. The lovely Gabrielle Bonnet came to Mobile aboard the ship called Pelican in 1702. Breathtakingly beautiful, Gabrielle had been one of about two dozen young girls recruited by the French government to marry and mother the future of colonial France. These girls came to be known as the pelican girls. Gabrielle was very lovely and was very popular among the colonial French Canadians who were stationed there. However, one man, who's name has been lost, won her heart and soon married her. Gabrielle fell deeply in love during the required month long courtship. Sadly, the day after her honeymoon night, her new husband rode off from the fort and deserted his young, beautiful wife. For a few months, Gabrielle wandered around Old Mobile with her black hair unbound, still wearing her white wedding dress. The sympathetic Mobilians tried to look after the grieving girl, but she would not be consoled and her behavior became more and more erratic. She often cried out his name and wandered around the woods screaming in heartbroken anguish. Having no money, and no family back in Paris, Gabrielle was hopelessly destitute. During the Mardi Gras celebration of 1703, Gabrielle ran into the woods surrounding the fort in her white gown with long wavy black hair flowing behind her. She was never heard of again, while she was alive. The following Mardi Gras some of the superstitious Indians of the fort reported hearing Gabrielle crying out in the woods around them. Since these first reports, many people have reported seeing the sad Gabrielle wandering around during Mardi Gras looking for her lost lover. Stay out of the woods during Mardi Gras. You may see the ghost of Gabrielle Bonnet! Wow, that's a classic southern story. Sad and beautiful and romantic. That is a very sad story, how cruel of her husband to leave her like that, she must have been devastated as well as heartbroken ... The Pelican girls were very brave I think, to come to an unknown country and begin a new life. I think it is a sad thing in some ways as women had few choices if they were poor, it is still the same for women in many countries. I was pleased to read that many of the girls and women did make suitable matches and were able to go on to make a better life. I love the image you have chosen for your narrative, it is most appropriate. Diane. You have a lovely blog. I even love your quote at the start about learning to dance in the rain. I'm a counselor and I wish I could teach that to everyone I worked with. I'll watch your blog with interest. GREAT pic to go with this very romantic tale. I love stories like this too...unrequited love and love lost. Very neat.